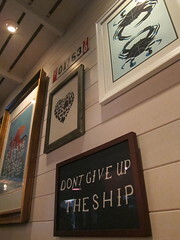 If Water Grill, Hungry Cat and Santa Monica Seafood have been our beacons of reliable Los Angeles seafood dining throughout recent history, they’ve paved the way for the casual neighborhood seafood restaurants that slowly trickled in after. Santa Monica’s Blue Plate Oysterette is close to hitting their four year anniversary, 3rd Street’s Son of a Gun just passed their second year mark and Silver Lake’s L&E Oyster Bar surpassed their first a few months ago. Perhaps we could all say that we saw this casual New England Seafood thing coming from a mile, or more, away. Which brings to focus the recent venture of one of a couple Water Grill alumnus responsible. (West Hollywood got their own, as of last week – which brings me to a whole new commentary about that seafood-or-scene-loving demographic, altogether.) But David LeFevre’s 32-seat, Manhattan Beach “upscale seafood shack,” Fishing With Dynamite, doesn’t offer a lobster roll. It’s probably the most popular and most covered sandwich in Los Angeles food journalism today (with one of the best renditions offered on a food truck) to the point that it’s almost FWD’s omission. On the other hand, I can respect a guy who really loves working for himself, trends be damned. Instead, he serves lobster fresh and in the raw, here, which is indicative of the restaurant’s main strength – its raw bar. Of course, at any seafood place, it’s only fair to evaluate the prepared dishes separately from the raw, but with Chef LeFevre’s talent, it’s more and more obvious that its spectacular raw selection is as much a strength as its concentrated menu of prepared dishes. And these prepared dishes, which are almost outnumbered by the beer selection, really pop. 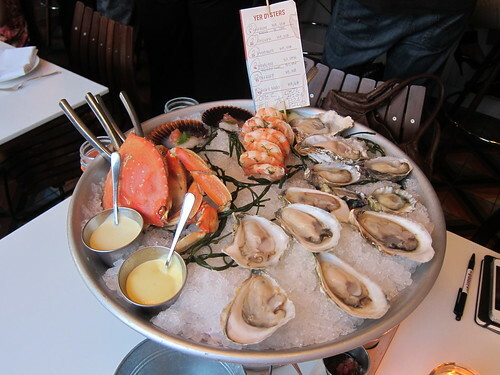 But make no mistake: You’d be remiss if you didn’t a order a raw platter of shellfish, which includes an assortment of oysters, scallops with a sliver of grapefruit, mussels, clams, lobster and Dungeness crab – all extra fresh for the picking. 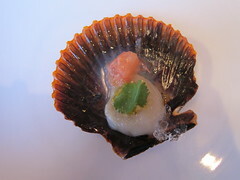 A favorite oyster in our selection that was new to me was the Shigoku – a meaty selection with medium brine. (I later found them at Connie & Ted’s, so get them while you can.) The shrimp come with two delicious sauces, a Yuzukosho mayo and a saffron aioli, a welcome departure from cocktail sauce. You can dress your oysters with an assortment of sauces, which include mignonette, ponzu and pico de gallo. Though many, no doubt, appreciate these extras, my personal preference is to taste each of the oysters and compare with their geographical origins, adding only lemon. The prepared dishes are separated into “Old School” and “New School.” In the former, you’ll find “Chowdah,” Steamed Manila Clams and linguica, Maryland Blue Crab Cake and Loup de Mer. If you’re lucky, Chef David’s mom’s extra lucious, melt-in-your-mouth Cape Cod squash rolls with rosemary butter will be handwritten below them – a must-order. While the crab cakes had more pickling in it than I’m used to, I really loved the freshness and preparation of the Loup de Mer, which had a perfectly crispy skin with a subtle red wine reduction for a complimentary underglaze. And, of course, fennel. I loved the broth of the Manila Clams as much as they were delicate – as well executed as or better than any other steamed clam dish. It had this awesome punch to it thanks to the vermouth. But the Chowdah? David LeFevre’s New England Clam Chowder is essentially the best I have had. It was a way to reconsider the state of clam chowder, before the age of Campbell’s Chunky line of soups – when chunkier wasn’t necessarily better or higher valued, but taste was. The broth was thin, runny and flavorful – with the perfect balance between cream, butter and spice. Only a couple Weiser potato medallions lay on top of left-in-the-shell clams while chunks of delicious whitefish sat on the bottom of the bowl. Neuske’s bacon and housemade oyster crackers were perfect finishing touches. I wanted two more bowls. Or more. 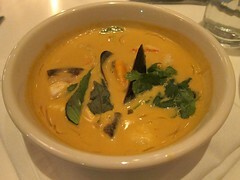 Of the “New School,” the Thai Shellfish & Coconut Soup was the shining star. I loved that rice noodles swam in the vibrant, kaffir lime leaf-coriander-infused broth alongside the shrimp and mussels; it’s a welcome Southeast Asian flavor addition that compliments the rest of the menu. I liked that the mussels were in this dish and the clams were used with linguica. And take heed of the Spicy Albacore Tuna Tartare, for its unsuspected spice (or maybe I just wasn’t taking the description seriously). You’ll order it as much for that as for the housemade shrimp chips, which were quite honestly more tasty and dense than any I’ve had in any typical Chinese duck dish. As for dessert: The Key Lime Pie is the no-brainer. It’s as attractive as it is perfectly tart and creamy, with little drops of meringue decorating the welcomed ending to a spectacular meal. This entry was posted in cocktails, Food, seafood, South Bay, wine and tagged @chefdlefevre, @eatfwd, beer, chef, cocktails, crab, crustacean, David LeFevre, Downtown Manhattan Beach, Fishing With Dynamite, lobster, Loup de Mer, Manhattan Beach, oysters, raw bar, seafood, South Bay, wine. Bookmark the permalink.